There are two methods to gain additional guide wires to the venous system for pacing. First is to use the existing wire and piggy-back an additional wire (also called double wiring). The second method is to do additional venous punctures and gain access. The authors’ personal preference is to do additional punctures (see below as to why) but double wiring is a very useful backup method when punctured access is difficult or tricky. The authors’ personal preference is to do additional punctures (see below as to why) but double wiring is a very useful backup method when punctured access is difficult or tricky. In the piggy back (double wire) method, a sheath along with the dilator is passed over the existing guide-wire. Thereafter the dilator is removed while keeping the guide-wire and sheath insitu. Now the second guide wire is sent in parallel to the first guide-wire through the sheath thus ending up having two guide-wires within the sheath. Thereafter the sheath is taken out leaving two guide-wires in the vein and their positions confirmed flurospcically. The medial most wire is selected for the atrial lead sheath and clipped to the drapes and kept away. The sheath dilator set is re-assembled, flushed and re-inserted along the free guide-wire thus establishing a sheath for the ventricular lead. One potential acute drawback of using this method is that there may be para-lead leakage of blood as there is a large opening in the vein – this may require a purse string suture around the leads before closure of the pocket. The advantage of performing an additional puncture is that adequate spacing can be gained between the future leads – i.e. increased longevity of leads by minimize inter-lead friction. When a double wiring technique is employed, technically, both guide-wires enter through a single venotomy and therefore the future leads lie very close together, raising the possibility of friction damage. However some international centers of excellence dispute this theory and perform double wiring almost exclusively. 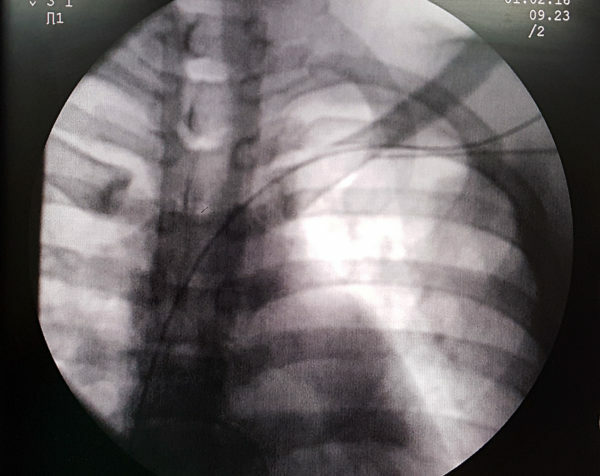 The most important benefit of double-wiring is that there is no added risk of a pneumothorax – which is not the case when doing a second puncture. The author’s approach is to attempt a second puncture if the puncture for the first wire was easy and switch to double wiring if the second puncture proves to be difficult. Double wiring is also preferred in patients who are at higher risk of a pneumothroax. A second puncture is preferred if the initial guide-wire is appears “tight” and not supporting of two closely spaced leads. For dual chamber ICDs and CRTs separate punctures are preferred as lead thicknesses and sheaths vary.